* Romance of the Victorian era is beautifully captured in this exquisite heirloom quality wholesale bridal necklace by Mariell. 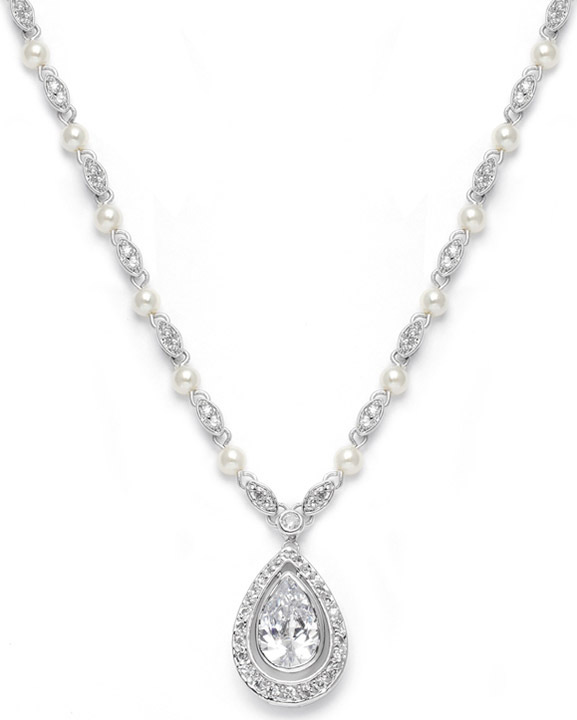 * Our antique style wedding necklace has dainty ivory pearls & pave Cubic Zirconia stations. * The center features a bold caged Cubic Zirconia teardrop dangling in a pave CZ frame. * This 15" - 17" Victorian bridal necklace has 4mm ivory pearls & pave Cubic Zirconia stations. * The center features a 1" h x 5/8" w bold CZ teardrop. * For a one-of-a-kind heirloom wedding look, wear this gorgeous pearl and cubic zirconia jewelry by Mariell. * Dazzling matching CZ earrings (3838E) are sold separately.